Unfortunately, I can’t tell you much about it. I know it’s the work of Emiliano Troco, but I’ve not been able to find his web-site, nor a description of the piece, nor a version in a decent resolution. So all we have to go on at the moment is this thumbnail. If you know more, please leave a comment! It is difficult to see the benefit in Apatosaurus excelsus of cervical ribs held so far below the centrum – an arrangement that seems to make little sense from any mechanical perspective, and may have to be written off as an inexplicable consequence of sexual selection or species recognition. It certainly seems to have been doing something weird with its neck. It’s not obvious why big flaps like these would require honking great cervicals ribs to hang down from, but maybe it was swinging them around or something? Those aren’t neck flaps! That’s a support balloon deflated in anticipation of an imminent lightning storm. That bront should be shown walking backwards with its head bumpity-bumping on the ground. I enjoyed Andrea’s post, and his point is duly noted, but I was totally frustrated by the fact that Troco has ZERO web presence. That may be part of the problem, though anglocentrism is probably part of it. 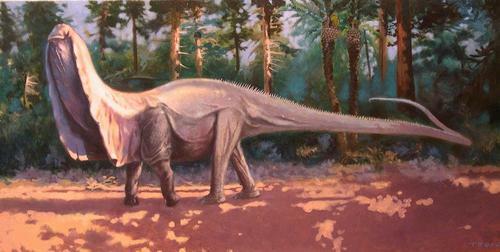 This Apatosaurus reconstruction is the most bizarre restoration of any sauropod I have seen. Than again, since we have no idea about soft tissue anatomy in sauropods(except skin impressions), there is always that possibility. Although personally I don’t see why apatosaurus would need huge skin flaps, as you mentioned the cervical vertebrae are “crazy”, but huge skin flaps would have possibly interfeared with flexiablity . Overall, this reconstruction shows how fantastic and bizarre sauropods are compared to other animals past and present. unfortunately, most of Emiliano Troco’s palaeoart is visible – online – from my blog only, (in particular those works resulted by collaborations with me). He is not an internet-addicted nerd (like me, for example) but an artist in the good traditional sense, with an atelier where his works are exposed. Hopefully, a site will be available in the future. Just a note, I understand what Mike meant with the title “worthy of All Yesterdays”, but I would like to remark that most of the “all-yesterdays-like” works of Troco preceded All Yesterdays. It’s plausible that in the near future a new generation of palaeoart will be inspired by All Yesterdays, but Troco’s art is the result of his own personal elaboration (with a little contamination, very pedantic, by me, at least in the theropod works), and can be considered as the Italian counterpart of the same cultural phenomenon that, in the British context, has produced All Yesterdays. Matt, you are right that Apatosaurus wouldn’t need huge skin flaps. But then a proboscis monkey doesn’t need a huge nose, and a peacock doesn’t need a huge tail and a lion doesn’t need a huge mane. They have them not because they give a survival advantage, but because they are sexually selected: the genes for these features get passed down simply other individuals of the same species find them attractive. If Apatosaurus had neck flaps, that would be the reason for them. Andrea, I take your point that Troco’s work predates the publication (though probably not the creation) of the All Yesterdays art, and I hope we’ve never given the impression that Conway and Kosemen alone have worked in this style: in fact, we’ve featured similarly speculative palaeoart here several times. But I’m afraid David Orr is dead right: while Troco has no Web presence, he’s doomed to be underappreciated. I spent the best part of half an hour trying to find any information at all about the Apatosaurus piece, or a version wider than 500px, without success, which makes me pretty darned sure that it just isn’t out there. That’s just no way for an artist to make a name for himself in 2012. I’d love his work to be better known, and will happily do my bit to make it so by linking to it whenever possible. But I can’t do that when it’s not there to link to. I’m going to discuss with Troco about his Web presence very soon (spoiler: we are working together on a new sauropod picture… [both picture and sauropod are new]). Excellent news! On both counts! Troco’s skin flap thing is so crazy it’s kinda cool… and I should know, as I independently drew a few sauropod sketches with almost the exact same features many moons ago! Just gotta find my old sketchbook scans! (One was Isisaurus which made it doubly weird). I have to admit I was completely ignorant of Troco’s stuff until Andrea’s post. He definitely needs to get more recognition, it looks like he’s incredibly talented and has really nailed that naturalistic style. Interesting, Matt. If you can send me decent-quality scans of your pieces (dino squiggle miketaylor.org.uk) I’ll be happy to feature them on SV-POW!. Hard to tell from a 500px version how good Troco’s art is, but as best I can judge from that postage-stamp, it blends a pleasantly retro feel (Knight/Burian) with a much more adventurous palaeobiology. I’m keen to see more. I usually end up putting large iguana-like dewlaps on my diplodocids, though not as extreme as that. The logic behind it, at least in my case, is that such a dewlap would be useful for a big animal such as a sauropod to lose heat in warm environments, kind ofof like elephant ears. Of course, later I found the suggestion that the long necks and tails of many dinosaurs, as well as perhaps the frills of ceratopsians, had some role in increasing surface area for heat regulation. Mike, you are indeed right with what you said about features on animals like the proboscis monkey, and the peacock’s tail. The great thing about Troco’s apatosaurus reconstruction is that makes you think. Like others on here, I also do dinosaur drawings and lately, I do reconstruct my diplodocids also with a iguana-like dewlaps on the throats, and some macronarians with inflatable-nostril pouches like the hooded seal. I’m sure dinosaurs appearances would be be far surprising and bizarre than we picture them now. Those who saw my talk at the All Yesterdays launch event will hopefully remember that I showed this illustration! Anyway, as I have tried to point out at every opportunity, I absolutely agree with Andrea’s point that many people interested in dinosaur behaviour and life appearance are heading in the same direction together: David Orr said the same at Love in the Time of Chasmosaurs the other day (yesterday, I think). I want to point out here that ‘All Yesterdays’ may seen like an anglophonic event, but it isn’t obviously a British one. Memo – responsible for the ideas and themes as much as the illustrations – is Turkish and John Conway still speaks with an Australian accent. Good points about your co-authors, Darren, and I’ll also point out that I interviewed artist Christian Masnaghetti this week, an Argentine who has been inspired by Conway’s work and whom I think fits well with the All Yesterdays movement (http://chasmosaurs.blogspot.com/2012/12/artist-interview-christian-masnaghetti.html). And deviantArt is replete with international artists. The most conspicuous void I feel is a certain, highly populous Asian country which has given us a number of stunning fossils over the last two decades. Love this restoration (and also that bearded one in your recent entry)! Doesn’t m. iliocostalis capitis attach on or near the cervical ribs? At least that’s the case in theropods as far as I know. This may be another practical use of those giant ribs. On the other hand that’s a mainly ventro- and lateroflexive muscle so I’m unsure how much use it would actually be. Exactly: in mechanical terms, all the honking great cervical ribs do is give better mechanical advantage to the neck-flexing muscles — which would never have a whole lot of work to do anyway, thanks to our old friends gravity. Which is why we think that they were doing something completely different in Apatosaurus. For the climate, I think that such flaps of skin like that would be plausible since the larger area of skin results in a quicker heat loss much like the expanded ears of African elephants. Elephants also erect their ears for intimidation, this would allow the Apatosaurus to appear larger if said flaps existed. « What does it cost to publish a Gold Open Access article?